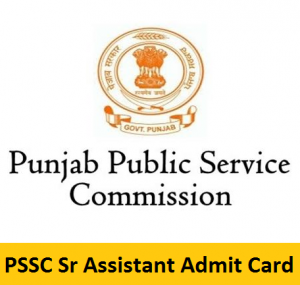 PPSC Senior Assistant Admit Card 2019 release date is announced by the officials of PPSC. Candidates who applied for the post of Senior Assistant and waiting for the admit card can download it from our page from 13th April 2019 by the direct link given at the bottom of the page. 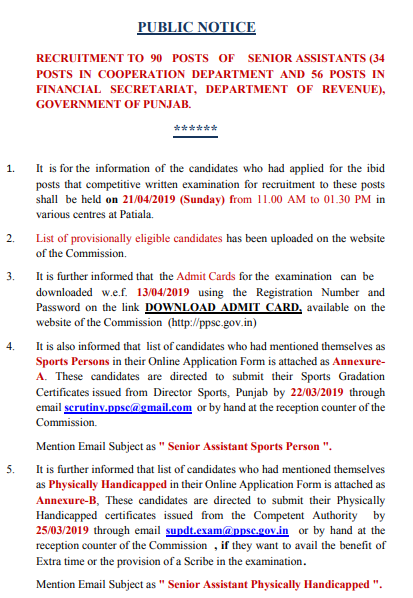 Moreover, the Officials of Punjab Public Service Commission declared that the PPSC Senior Assistant Examination 2019 for 34 vacant positions will be conducted on 21st April 2019. Candidates should download the admit cards before appearing for the exam. You can download it from the official website ppsc.gov.in or download it from our page. This is a good chance for the aspirants who are preparing for government jobs. This page provides you with the complete stuff about the ppsc.gov.in Admit Card 2019 including the selection process, documents to be carried, the stepwise procedure to download the hall ticket, and other details. We hope that these details will give you more knowledge about the exam. So, candidates spend time on this page and refer to the details given in the below sections. Coming to the selection process of PPSC Senior Assistant Examination 2019, it mainly consists of two rounds. A WRITTEN TEST followed by an INTERVIEW round. Only the eligible aspirants will be allowed to write the written test for which an admit card is very important. Hence, all the eligible candidates need to download the admit card before appearing for the examination. Moreover, the candidates who crack the written test will be promoted to the interview round. For this round, a call letter is a mandatory document. So, candidates selected for the interview round should carry their call letter along with them. After downloading the Punjab PSC Hall Ticket 2019, candidates are suggested to check the details on the hall ticket. If any of the information on the admit card is not correct, then immediately intimate it to the higher authorities of the Punjab PSC. Do not forget to carry the copies of some mandatory documents which are very essential for the security purpose. Without the admit card and the mandatory documents, candidates are not allowed to attempt the PPSC Senior Assistant Examination 2019. To download the Punjab PSC Hall Ticket 2019, candidates need to follow the steps which are mentioned below. Firstly, candidates need to enter into the official website of the Punjab Public Service Commission – ppsc.gov.in. You will get the home page of the official website. On that home page, search for the PPSC Senior Assistant Hall Ticket 2019 download link. Now, you will get a login form. After checking it once again, click on the submit button. Download the ppsc.gov.in Admit Card 2019. Take the hard copies of the hall ticket and carry it to the examination hall. As soon as the Punjab Public Service Commission officials release the exam date and admit card release date, we will intimate you through our page. Candidates preparing for the exam and waiting for the admit card visit our website freshersnow.com frequently for the latest updated information. You can also check the official website ppsc.gov.in for further information. Thank you.